When I was an undergraduate, I took a number theory course. I wasn’t a math major, but something about the subject called to me, even though it wasn’t required for my major. Our professor’s eyes danced with joy as he described the beauty inherent in number theory because of its “pretty proofs”. He went on to teach us some of their intricacies, and his proofs were indeed beautiful. Proof, by David Auburn, explores the artistry and drama of mathematics (specifically prime numbers), along with the genius and madness of its practitioners. 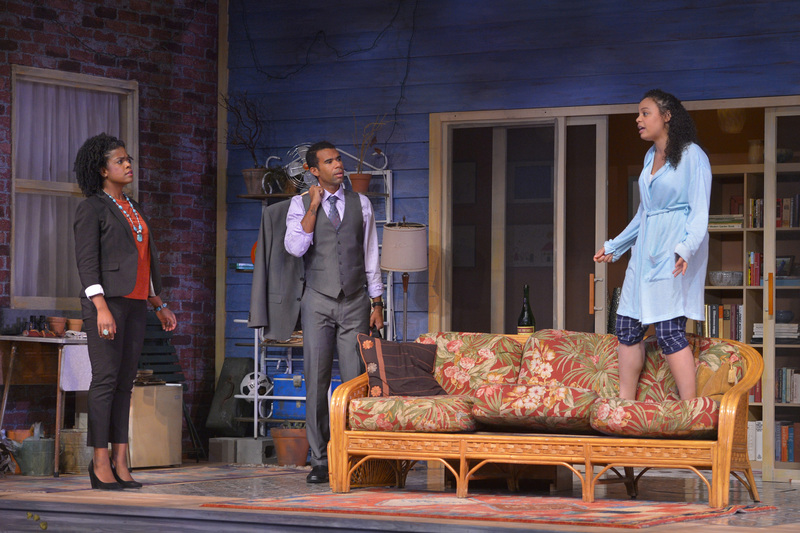 As expected, TheatreWorks’ production of Auburn’s prize-winning play is primed for greatness. We later meet Hal (Lance Gardner), one of Robert’s former PhD students, and Claire (Ashley Bryant), Catherine’s estranged sister. There are several twists and turns as the story progresses, and issues such as the bias against women in math and the inheritance of madness are explored. We find out that Robert was brilliant in his younger days, accomplishing works of genius in multiple fields of mathematics, including “game theory, algebraic geometry, and nonlinear operator theory.” He was later plagued by mental illness when his “machinery” slipped away, i.e., his cognitive abilities waned, and delusions set in. Catherine has spent a large portion of her adult life caring for her father, while Claire has gone off to live her life. The sisters are both concerned that Catherine may have inherited more than their father’s mathematical gifts, but Catherine also guards a wondrous secret. Director Leslie Martinson has staged the production beautifully. There’s a fluidity and urgency to the action making us care about the characters. There is humor, whimsy, and even a bit of desperation, all packaged into scenes that are very relatable. One interesting thing about the play is that the family can be any race or ethnicity, and the University of Chicago has a long history of diversity. The one requirement is interest, nay, immersion in, and love of mathematics. Martinson cast Callender first. Once he was set, she rounded out an African-American family. The father-daughter interaction between Callender and Beck demonstrates that Robert and Catherine are very close, and they have great affection for one another. They are playful and intense, as well as caring and serious. Robert and Catherine have great respect and empathy for one another, and Callender and Beck bring this out in their inflections and motions. Beck and Gardner also work well together, first via a confrontation that later blossoms into a budding romance. They too are believable. Gardner captures the nerdy math stereotype, appearing socially awkward and kind of ungainly at first. He plays Hal with great depth, bringing out his respect and admiration for Robert. Hal first measures math prowess by educational level and social biases, but he grows to appreciate that there is more to the skills than academic degrees. The interaction between Beck and Bryant shows that the sisters are antagonistic toward one another. They don’t know each other, and they make assumptions that are not necessarily correct. There’s friction that is extremely bristly and believable as they deal with inheritance issues, the elder Claire pushing her agenda onto Catherine, and Catherine pushing back. 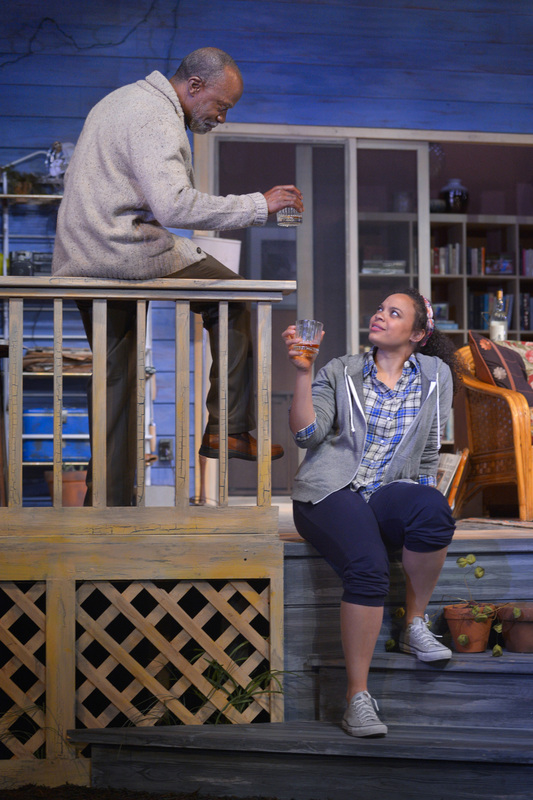 Annie Smart’s scenic design is gorgeous, the action taking place on the covered back porch of Robert’s house. We can see into the house upstage center into what appears to be a library, and doors up right and left lead into other parts of the house. There are leaves on the steps, and the well-worn porch furniture indicates that this is clearly a space that has been used by the family a lot over the years. From its gentle humor, to its exploration of the beauty of mathematics, to its handling of the tangles of familial (and societal) expectations, the play is exceptional, and TheatreWorks’ production is enthralling to watch. The trip from genius to crazy may be infinitesimally short, but appreciating Proof…that’s infinite. See http://www.theatreworks.org/shows/1516-season/proof, email boxoffice@theatreworks.org, or call (650)463-1960 for more information or to order tickets.